To meet growing demand in China for vehicles like the 2009 Audi A4, only 2.36 inches longer, Audi has just unveiled the A4L, an A4 with an extended wheelbase. The lengthened wheelbase should show itself in the backseats, which have increased legroom proportional to the stretch. This creates a vehicle that should sit somewhere in between the regular A4 and the A6 in both price and space and is an indicator of the lengths car makers are now going to pursue sales the world’s fastest growing car market, China. Audi presents long-wheelbase A4 for the Chinese market * First long-wheelbase version in China’s premium B segment * Marketing and Sales Board Member Schwarzenbauer: “We will export the success of the new Audi A4 to China” * Market launch in January 2009 Audi is the first premium brand to introduce a prestigious long-wheelbase version in the upper mid-size category exclusively for the Chinese market: the Audi A4L’s wheelbase is 60 millimeters (2.36 inches) longer, which benefits rear-seat passengers in particular. The A4L thus offers unrivalled spaciousness in its segment. 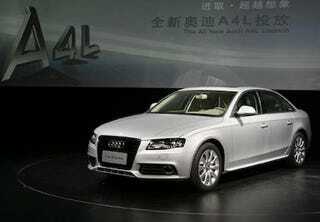 Manufactured at the plant in Changchun, China, the new Audi A4L made its debut yesterday in Beijing. Peter Schwarzenbauer, Member of the Board of Management for Marketing and Sales at AUDI AG, and the President of the FAW-VW joint venture, An Tiecheng, emphasized the importance of the new Audi A4L for the Chinese market. Schwarzenbauer said: “The long-wheelbase version of the Audi A4 is being produced exclusively in China for the Chinese market. With this premium product, we chose to go even further than elsewhere in the world to meet the requirements of our Chinese customers.” Since its worldwide market launch last year, over 200,000 units of the Audi A4 have been sold. It was recently voted “Most Beautiful Car of the Year” by readers of Auto Bild, a German automotive magazine, and thus overall winner of the „Auto Bild Design Award 2008“. “Our goal is to export the success of the new Audi A4 to China. With the customized Chinese A4L, which we subjected to rigorous testing in China, we are impressively demonstrating our market leadership in China’s premium segment,” added Schwarzenbauer. With the A4L, Audi has created an automobile which outdoes the competition in terms of driving comfort, luxury, spaciousness, and design. The chassis was tailored to Chinese road conditions to provide exceptional suspension comfort. The wheelbase – 60 millimeters (2.36 inches) longer than the A4 sedan’s wheelbase – makes the A4L a unique vehicle. The longer wheelbase lends the A4L an especially roomy feel and makes getting into the rear seats even easier. In addition, the longer wheelbase is of particular benefit to rear-seat passengers, who can enjoy legroom unparalleled in this vehicle segment. Thanks to the increase in length and high-quality technology, the A4L injects full-size class into the mid-size category. For the time being, two engine versions will be available for the Audi A4L in the Chinese market: the 2.0 TFSI with 132 kW (180 hp) and the six-cylinder 3.2 FSI with 195 kW (265 hp). Audi has been offering a long-wheelbase version of the A6 in China since 2000. Now in its second generation, it provides better driving comfort, spaciousness, and design than the competition. Drivers and passengers of the 4.76 meter (15.62 feet) long A4L will enjoy similar advantages as it can be enjoyed as both a driver’s car and a chauffeured luxury sedan. The Audi A4L, which will be rolled out starting at the Guangzhou Motor Show on November 18, will be at Chinese dealerships as of January 2009. AUDI AG sold a total of 964,151 cars in 2007 and thus achieved its twelfth consecutive record year. With revenue of €33,617 million and profit before tax of €2,915 million, the company attained its best figures ever. Audi produces vehicles in Ingolstadt and Neckarsulm (Germany), Györ (Hungary), Changchun (China) and Brussels (Belgium). At the end of 2007, production of the Audi A6 started in Aurangabad, India. The company is active in more than 100 markets worldwide. AUDI AG’s wholly owned subsidiaries include Automobili Lamborghini Holding S.p.A. in Sant’Agata Bolognese (Italy) and quattro GmbH in Neckarsulm. Audi currently employs around 57,000 people worldwide, including 45,000 in Germany. The brand with the four rings invests more than €2 billion each year in order to sustain the company’s technological lead embodied in its “Vorsprung durch Technik” slogan. Audi plans to significantly increase the number of models in its portfolio by 2015 to 40.